Dryopteris filix mas growing fern leaf plant of the genus Dryopteris also known as Male fern, Dryopteris filix mas perennial evergreen or cold deciduous used as ornamental plant, can grow in temperate, mediterranean, subtropics climate or as houseplant and growing in hardiness zone 2-10. 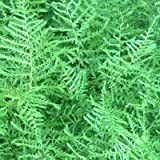 Leaves color green in bi-pinnate (in fern) shape. 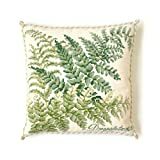 Dryopteris Needlepoint Kit by Elizabeth Bradley. A premium English needlepoint pillow project on a Winter White background with 100% wool yarns. Shade Garden Collection.